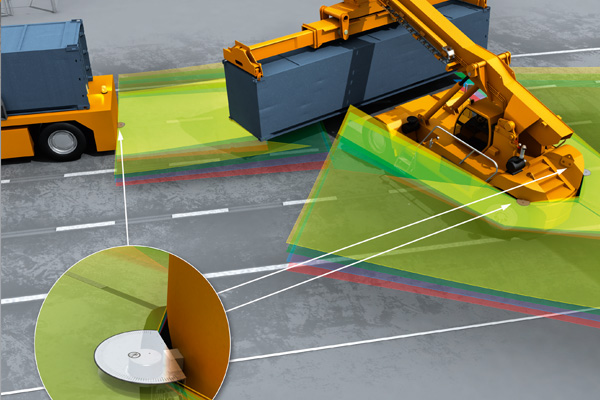 Driver assistance systems based on 3D LiDAR sensors (also 3D laser scanners) or 3D vision sensors from SICK reliably detect blind zones around mobile machines and warn the operator of potential sources of danger or accidents in good time. Beside intelligent 3D assistance systems with the Visionary-B 3D vision sensor, the MRS1000 3D LiDAR sensor provides navigation and maneuvering support. Loading situations in the port: The MRS1000 supports the crane operator with reliable monitoring of the surrounding ground and assists the reach stacker driver when loading containers. Maneuvering and driving in reverse are frequent causes of accidents on construction sites and in surface and underground mining, but collisions also occur in locations where cargo is handled, such as ports. Moreover, in agriculture, imprecise fertilization or harvesting processes result in losses if harvesters do not correctly recognize the contours of the windows, for example. At the same time, these industries are also under a high level of pressure to ensure efficiency: While agriculture must produce an increasing amount of food for an increasing number of people, the costs of some raw materials are hitting rock bottom. In order to continue extracting raw materials in a profitable manner, work processes must become more efficient. Building projects are always faced with huge time pressure and also involve a higher risk of accidents due to the fact that humans collaborate closely with machines. However, many collisions and accidents can be avoided if the machine operator is supported by suitable technology. Simple warning functions are often not enough. The system must also be able to distinguish between different objects depending on their importance for collision warning purposes. In order to make this distinction, it is essential that objects are detected in terms of volume. The at times harsh ambient conditions in the fields of application also pose an additional challenge. Based on decades of laser technology expertise from SICK, the MRS1000 3D LiDAR sensor is now opening up a broad spectrum of perspectives for driver assistance systems “in the field.” The sensor detects up to 55,000 measurement points across four layers. The MRS1000 emits three echo signals per measuring beam, thereby increasing the number of measurement points to up to 165,000 per second. The layers are arranged horizontally, one on top of the other, and fan out from the sensor. 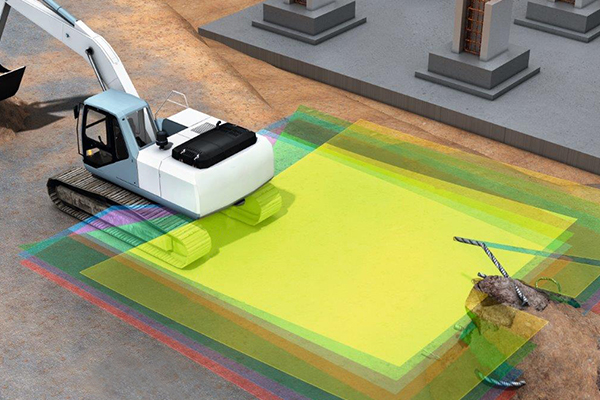 At a distance of 20 m, for example, the MRS1000 covers a height of 2.70 m. Excavators, too, benefit from the various application possibilities afforded by the MRS1000. It controls the movements of the excavator’s arm, for example. The sensor monitors the absolute positioning of all moving elements in relation to one another, and the machine operator can adjust, accelerate, or decelerate the movement accordingly. With simultaneous measurement on four levels, the MRS1000 also detects objects which are on the floor or obstructing the path. Even when operating merely medium-sized excavators, the driver’s view is limited. The MRS1000 uses the innovative HDDM+ technology. It enables measurement across long distances and is characterized by low measuring value noise as well as multi-echo capability. Thanks to the individually configurable echo filter, the 3D LiDAR sensor screens out unwanted measurement data and signals caused by rain, dust, snow, and other disruptive ambient conditions, for instance. The field evaluation takes place directly in the sensor, with high scan speed and wide measurement field coverage. With its large, vertical aperture angle of 275 degrees, the MRS1000 covers a working range of up to 64 m. Within this working range of up to 64 m, the MRS1000 reaches all the areas surrounding the vehicle – even those that the machine operator cannot see. Even when visibility conditions are difficult or objects are moving, the MRS1000 provides reliable measurement data thanks to three echo signals which are emitted for each measuring beam. Depending on the operating conditions, additional filters are available – increasing the availability of the MRS1000 even further. In ports, for example, a fog filter can be used. This enables the 3D LiDAR sensor to eliminate unwanted echoes at close range which can otherwise result in the sensor being triggered incorrectly. An additional particle filter blanks irrelevant reflection pulses, such as dust particles, in dusty and harsh environments found during surface mining and on construction sites, for instance. The MRS1000 is designed in such a flexible and rugged manner that it can operate in many different fields of application. With an enclosure rating of IP67, its housing is not only able to withstand dirt and unfavorable weather conditions, but also temperature fluctuations ranging between –30 and +50 degrees Celsius. What is more, the MRS1000 has connections which can be positioned flexibly, meaning that there are virtually no limits when it comes to mounting the multi-layer scanner. The field outlines can be adapted to the task at hand. Specific configurations can also be applied to each of the four layers. 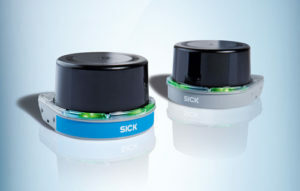 The MRS1000 can be configured using the proven SOPAS ET software from SICK. The sensor data is visualized via the web server in a convenient and customer-friendly manner.